The Lepika is a 2003 33’ Force custom built locally in Hilo, Hawaii. 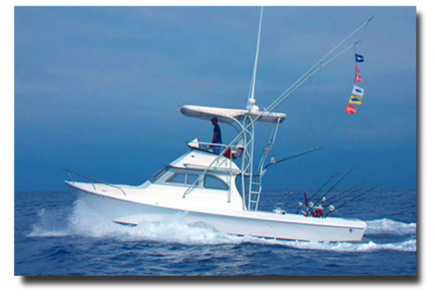 Force boats are known locally as one of the most comfortable boats for Hawaiian waters and more so for their fish raising abilities. She is powered by twin Cummins 260hp inboard engines. She cruises at 20 knots and tops out at around 30 knots. Her open cabin provides a lot of shade and cool airflow to keep you out of the hot Kona sun. The twin bunks let you sit in shaded comfort in clear view of the lure spread behind the boat. The fly bridge also has seating above the cabin that will give you an even better look at the spread. She is equipped with top of the line Furuno chartplotter/radar and Furuno fishfinder/sounder. The Furuno radar has proven invaluable at quickly finding bird piles that follow feeding fish. I also use a pair of Nikon gyrostabilized binoculars to scan the horizon for floating debris or dolphin pods. A large live bait well was also custom built into the deck which allows us to carry more than enough live bait. Our tackle is top of the line Accurate Platinum Twin Drag reels matched with custom Ian Miller rods from Australia. The Lepika is ready for any line class you prefer from light tackle 30lb, 50lb, 80lb to heavy 130lb. We also specialize in green- stick tuna fishing. For our fly fishermen, we always have 3 Sage rods with matching Ross Canyon Big Game reels in 10wt, 12wt and 14wt. I’ve spent a lot of hours on the water finding lures that raise fish. My lure pattern consists of some of the best lures made in Kona. Whether they were hand made by me or purchased from local lure makers on the island, I guarantee what I put out in our pattern will give us the best chances of a successful trip.